The findings show that when recipients are considered in groups, people tend to allocate organs equally across the groups, ignoring information about the patients’ chances of success. 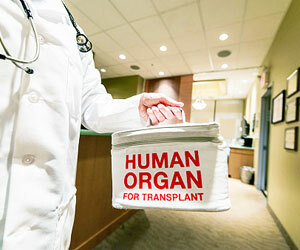 “This is important because public policies about prioritizing resources are framed at the group level — for example, younger recipients are prioritized for the best transplant organs — and yet actual allocation decisions are often made at the individual level,” explains psychological scientist and senior study author Gretchen Chapman of Rutgers University. In collaboration with first author Helen Colby (Anderson School of Management, University of California, Los Angeles) and co-author Jeff DeWitt (Rutgers University), Chapman asked 470 participants in an online study to allocate six kidneys across a total of 12 hypothetical patients. Headshot-style photos of the patients were presented in a grid that had a vertical line running down the middle, with 6 patients on either side of the line. Some participants saw “Chance of Success: High” written over top of the right side and “Chance of Success: Low” over the left. For other participants, the same information about chance of success was written instead under each individual patient photo. Also, some participants made a decision about how many kidneys to allocate per group, while others had to decide whether to allocate a kidney to each individual patient. The most medically efficient decision — the one with the likelihood of saving the most lives — would be to allocate all 6 kidneys to the patients with a high chance of success. But the researchers hypothesized that presenting the patients in groups might lead people to make less efficient decisions. As expected, participants made more efficient decisions when the chance of success was presented for each patient compared to when it was presented for the two groups; patient-by-patient allocation decisions were also more efficient than those made by group. The findings showed a robust grouping effect, regardless of the types of labels used to identify the groups and the amount of information provided about the potential recipients. “If managers making decisions about hiring or promoting employees were to have candidates grouped by gender instead of presented as individuals, they might be prompted to spread jobs across the groups more evenly, which would lead to the hiring or promotion of more women,” explains Chapman. The researchers plan on exploring the potential positive outcomes of grouping in future studies. This research was supported by National Institute on Aging Grant 1R01-AG037943-01 (to G. B. Chapman). All data and materials have been made publicly available via Open Science Framework and can be accessed at https://osf.io/wk3ve/. Study 3 was preregistered at https://osf.io/k29e6/. The complete Open Practices Disclosure for this article can be found at http://pss.sagepub.com/content/by/supplementaldata. This article has received badges for Open Data, Open Materials, and Preregistration. More information about the Open Practices badges can be found at https://osf.io/tvyxz/wiki/1.%20View%20the%20Badges/ and http://pss.sagepub.com/content/25/1/3.full.